As Requested I've take a photo shoot of my Trygon Model entry for the Warpstone Painting competition. The model took me approximately two hours to assemble, and then 8 hours of painting all done on the release date of this particular miniature (if you can call it miniature). The base is made of an assortment of slate stone fragments, sand, and moss. I was going to go for a water effect base, resembling something like a great serpent writing from a great body of water, however due to time restraints i had to leave out this part of the modeling process. Just for a note, this model was purchased built and painted all in the course of one day, 24 hours. 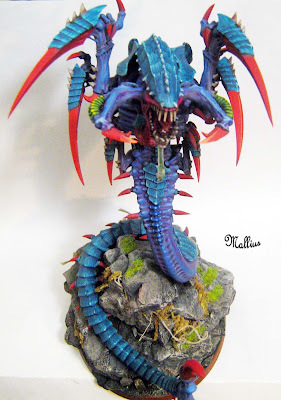 The Paint Scheme i used for this model was developed over much debate on how exactly i'd like my Trygon to look, after debating on a few colour schemes i chose one that most closely represented the intended effect. Using a colour pallet of soft muted (other than the red) cool colours i would draw out that alien oceanic feel. I love using turquoise, purples and blues in a great deal of my painting, i like how the colours blend and compliment eachother. The red talons were added later after deciding the model needed some contrasting warm colours to really bring out the deadly nature of the beast. 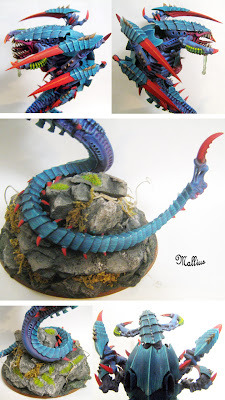 In nature this is often exhibited on deadly flora and fauna, so i wanted to embrace the evolutionary qualities in the tyranids with colours that say danger. What better way to do this than with bright red! The methods used for painting this model include a various number of blending techniques, selective washes and line work. The mucus hanging from the Trygon's mouth is a melted down plastic flying stand, with a light green wash applied. A note on the tail, the tail was melted slightly in a pot of boiling water to get it to coil around the rock as shown in the above photos. This was done very carefully so not to melt or break any of the spines on the model. To assure this, the bending process was done in several short increments. After the bending was complete the flat underside of the trygon body was re-sculpted using epoxy putty to simulate the beasts muscles propelling itself up the rock. All in all this was a fun model and a very interesting project considering the time restraints, the model came in a close second place in the final warpstone painting competition judging.